It’s reigning pale pinks and soft blues this year all courtesy of Pantone. In an unprecedented move the institute have nominated not one but two colors this year; Rose Quartz and Serenity. For those who have been hiding under a rock for a while, the Pantone Color Institute is the world’s leading authority on color standardization. Each year Pantone releases a color, which shapes forthcoming fashion, home décor and wedding trend forecasts. 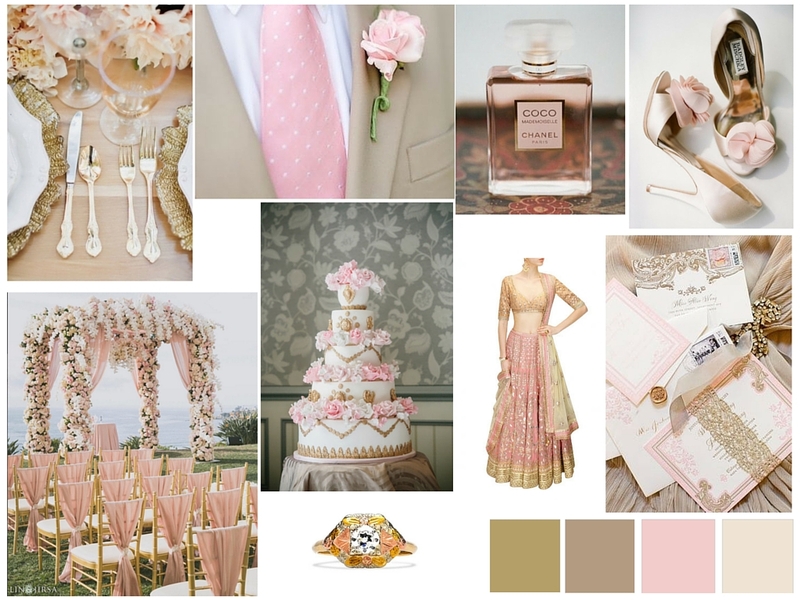 To see how these hues can inspire your wedding, we have scoured the internet and got our creative juices flowing to create elegant and romantic inspiration mood boards. 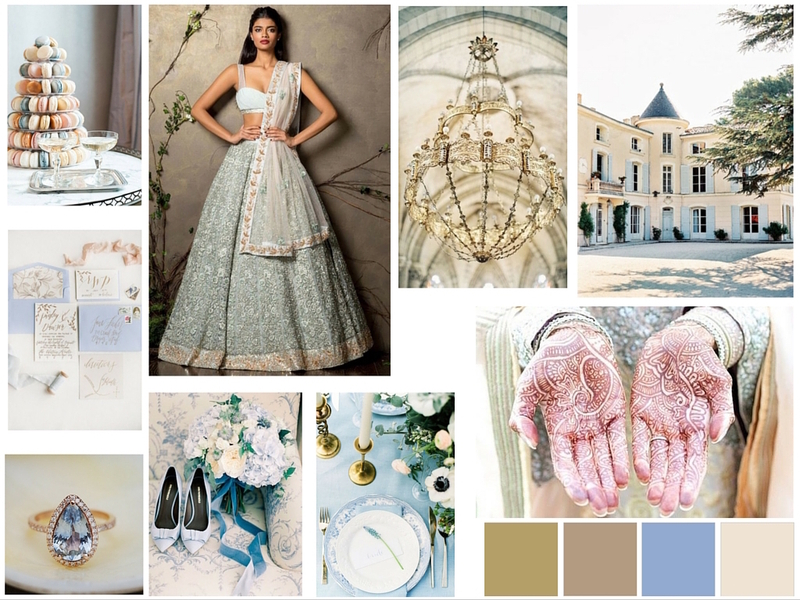 Paint your wedding festivities with rose tones and tranquil blues and layer with antique golds, champagne beiges and muted ivories to give your wedding a luxe appeal. For our rose quartz palette we have blended beautiful and chic wedding ideas that are glowing with elegance. Vintage touches with a hint of opulence. Place setting: Add style to your wedding table with gold plated ornate china wear and cutlery. Infuse blush pink roses into your tablescape to create an eye-catching setting. Boutonniere and tie: A mens boutonniere or buttonhole need not be over the top in this case. Inject some color and personality into the groom’s trousseau. Mix it up with a fun polka dot tie and one single pink rose. Accompany the accessories with a neutral shade suit and you have a classic yet simple look. Perfume: Mais oui (but yes), Chanel! The beauty of this too is that the perfume bottle will look absolutely stunning in your photographs. Shoes: These beautiful Badgley Mischka heels will add the right amount of color to your bridal trousseau and definitely won’t look over the top with your blushing pink toned bridal gown. Outdoor setting: This isn’t a mandap, but just imagine! Something similar would make for a stunning backdrop. Adorned with luscious pink and ivory roses and complemented with metallic chairs, your wedding will be the talk of the town. Cake: As Marie Antoinette once famously quoted, “Let them eat cake.” A standout wedding cake like this one from Cakes By Krishanthi layered with frosted pink and white petals and beautiful gold Victorian style details will stand out in any wedding venue. Lehenga: Anita Dongre’s signature gota patti embroidered lehenga choli’s usually feature floral patterns and subtle gold foiling, hence the reason why we thought this gorgeous feminine outfit is perfect for a wedding of this style. Invitation suite: Founder and stationery design extraordinaire, Ceci Johnson of Ceci New York believes that “Every legendary party begins with an unforgettable invitation.” This deluxe gold and blush invitation suite will add a lovely touch to the overall theme building anticipation for your guests. Ring: Whether it’s the engagement or wedding ring, this one from Trumpet & Horn speaks for itself. An unusual art deco vintage ring with yellow, rose and white gold accents. Perfect! Our serenity wedding color palette has been drawn from European influences (French to be exact) combining dreamy neutrals and creams offset with once again metallic and accents of rose quartz as well. Macarons: What is a French inspired wedding without this delectable dessert? We love this striking macaron tower nestled next to vintage champagne glasses, sitting pretty on an antique sweetheart table. Invitation suite: This stunning powder blue and cream Karli Noel invitation suite features hand written calligraphy with gold lettering. The perfect wedding invitation suite for your French destination wedding. Lehenga: We love this luxurious, artisan pastel blue couture lehenga from designer’s Shyamal & Bhumika’s ‘A Little Romance’ collection. Create a statement with a gorgeous lehenga such as this one. Perfect for brides who love timeless and romantic looks. Chandelier: An ornate antique gold chandelier such as this one will add opulence to your reception venue as well as your wedding photographs. Chateau: A charming French chateau with all the trimmings is the ideal venue for a wedding of this scale and grandeur. This one looks particularly dreamy. Whisk your guests away to a European retreat for the ultimate destination wedding party. Ring: A beautiful rose gold Victorian engagement ring featuring a blue pear cut sapphire will match beautifully with the bridal trousseau. Bouquet and shoes: Go all out with your blue wedding palette. Pointy toed stilleto’s definitely add luxe appeal and once paired with the designer lehenga and a fresh bouquet of carnations or roses, your beau won’t be able to take his eyes off you. Place setting: Gold candelabras, fine china and fitted blue linens add to the classic and timeless wedding setting. Mehendi: Just when we couldn’t fall more in love with this inspiration board, we come across this stunning image over on Pinterest, featuring intricate mehendi work adorning a bride’s palms. Lovely details. Even if you decide against translating these colors into your design concept, what’s important is to ensure that you communicate your color choices into your overall wedding theme. From the venue to your décor through to your cocktails and cake, everything should balance well. 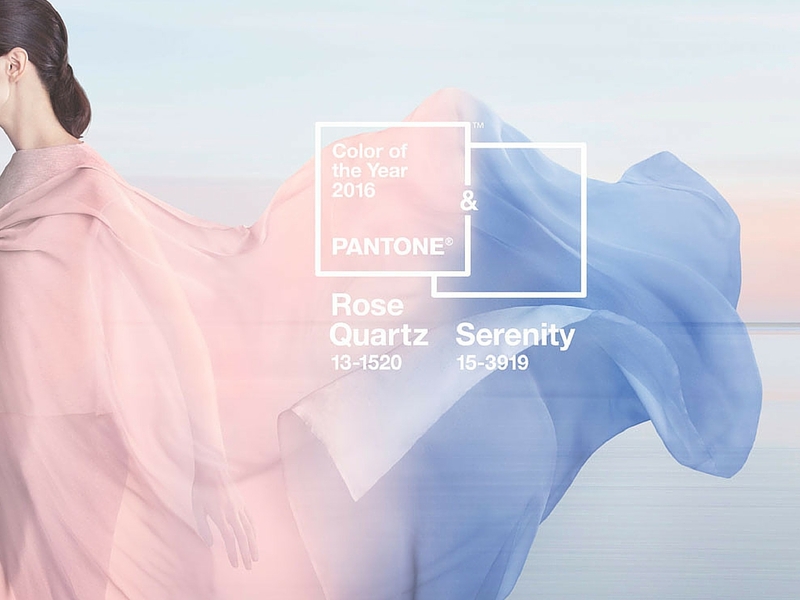 What are your thoughts on this year’s Pantone 2016 colors of the year? Will you be incorporating them into your wedding theme? Let us know in the comments below. Whether you are engaged or in the middle of wedding planning, it’s time to kickstart those new year wedding goals maharanis! Thankfully, we have a few pointers to guide you in the right direction. From wedding wellness to budgeting, here are our go to tips. There’s something incredibly special about Indian weddings – a jam packed, colourful, three day extravaganza filled with lavish décor, mouth-watering food, dance and loads of relatives you’ve never ever met! However despite our weddings being fun to plan and attend, there’s no escaping the dreaded wedding budget. It’s no surprise to hear that the cost of an Indian wedding has almost doubled in the last few years and whilst you and your partner would love that day to be about you, we know that ain’t going to happen.